SBPLI held their annual golf fundraiser, this year at the Wind Watch Country Club in Hauppauge. We supported them by demonstrating one of our robots modified to putt in the dinner room and talking to attendees about the robots and the FIRST program. 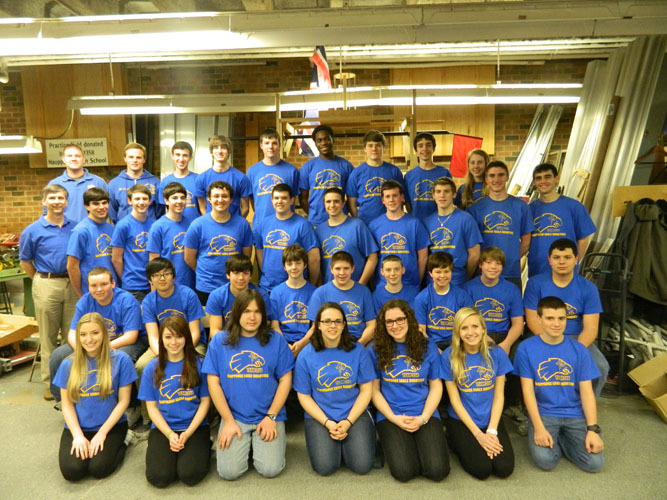 Webb Institute held an FRC Robotics Conference organized by Nolan Conway, president of the Junior Class, and we supported them with a lecture on the Control System and Field Management system, and a discussion of fundraising. We also raised a little money from selling the attendees pizza and soda for lunch. Presentations were given on "Strategies of Design: What to do once you know your game," and "How to be a Chairman�s award winning team." 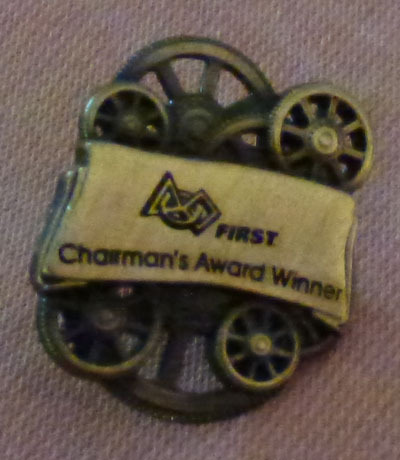 All students and mentors will also be given the choice of attending one of four lecture sessions: "Manipulators" by Frank Saladino, "The Control System: from FMS through the robot" by Mark McLeod, "Drive Train Selection" by Pat Hughes, and "Scouting" by Nolan Conway (Junior class president, Webb Institute). Safe Halloween - we challenged Trick-or-Treaters to a one-on-one game of basketball. Their skill against the robot, using a basket/backboard we taped to the wall in the Commons. The lines were long, but we had a lot of team members helping out. Hurricane Sandy - interrupted school and home life for a few weeks with a power outage that lasted up to 11 or 12 days. We were all picking up the pieces for awhile after that storm came through. Unfortunately, it postponed the Brunswick Eruption pushing the date out to fall on the same day as the first Half Hollow Hills Invitational. 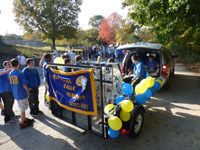 Half Hollow Hills Invitational - a first-time event, was held after Sandy had gone and luckily at a school that didn't lose power. 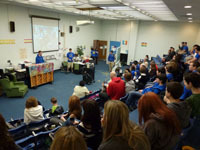 Twenty two teams gathered on November 17 at Half Hollow Hills West high school to replay Rebound Rumble. Teams were: Bay Shore, Brentwood, Central Islip, Center Moriches, Cold Spring Harbor, Comsewogue, Connetquot, Great Neck South, Hauppauge, Half Hollow Hills, Hicksville, Island Trees, Lindenhurst, Long Island City, Malverne, Miller Place, Patchogue-Medford, Plainview-Old Bethpage, Port Washington, Sachem North, Seaford and Smithtown. Center Moriches and Seaford competed as pre-rookie teams sharing an extra Connetquot practice robot. It was a fun time with driving by the freshmen as supervised by the seniors. A lot of teams attended and the gym was packed. We took home one of the championship trophies, along with our Alliance partners Team 263 Sachem Aftershock & . Event volunteering - Mr. McLeod FTA'ed at Finger Lakes, NYC, DC, Phoenix, Championship(Newton), CSA'ed at LI and MAR-Championship. The Oldies concert had to be postponed until the Spring because of hurricane Sandy. It then fell on the same day that we won the Long Island Regional. Middle School Science Fair - we put on our typical robot demonstration for the middle schoolers and parents at the evening science fair. Basketball for everyone. 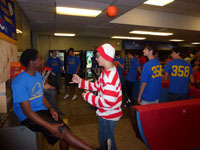 Kickoff Breakfast - a fine buffet feast in the hallway, FIRST webcast in the music room, Ultimate frisbee and climbing robots. Gershow aluminum donation, now an annual mid-January event, got us 50 lbs of plate and odds and ends due to the generosity of Gershow Recycling. Virginia Regional - Uneventful 7 hour coach bus ride with a stop for dinner at Delaware House. 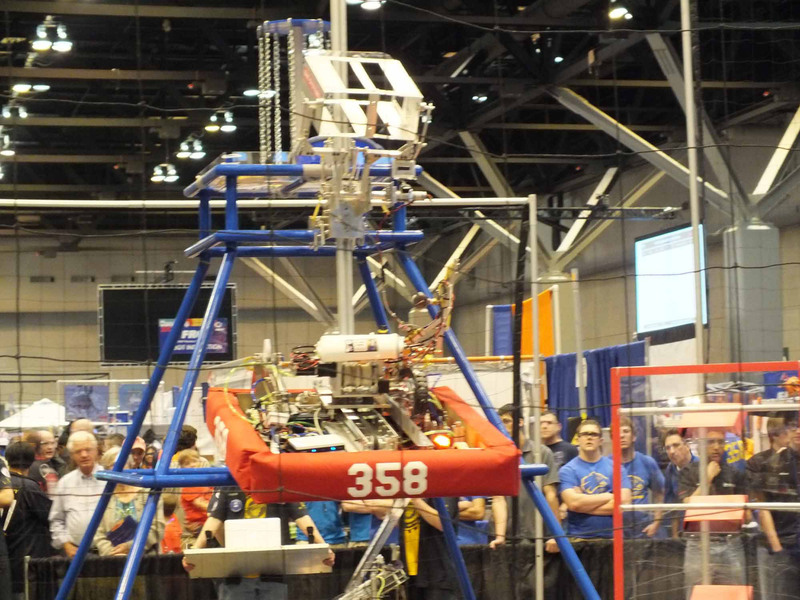 Robot driving was solid, but our robot's climbing ability was still being worked on when we arrived in Richmond. Alignment for the climb was off the first time, so a camera was dropped on for the drivers to use in lining up on the center of the bars. It grew gradually better, climbing to level 2 without a hitch, but still having difficulty with the steeper angle required by the third and final level. Flip down skids added to the front of the robot were further improved by slick material improvised from a cutting board. The Frisbee dumper worked great, but needed better motor control. Sensors on the sled and winch mast were unreliable, so limits were removed and left to the drivers judgment. We were not chosen for eliminations, so we were able to spend a lot of time improving the climb. at least until the cable broke late in the day and we bagged up. LI Regional - Champions along with 1796 the RoboTigers of Queens Vocational and Technical HS in Long Island City and 3171 P.R.I.D.E of Westhampton Beach HS, then surprised by winning the Chairman's Award. Two qualifying awards for St. Louis meant we really had to go. Applebee's for a team dinner on Friday night, because Saturday night we had the Oldies concert. Championship - planning happened two weeks before the event made for expensive airfare. Finals ran late as usual, so the Finale party was dangerously overcrowded and way short of food and time. CMP - fast shipping required us to use Monday to arrange for shipping the robot crate and a tools/cart/material pallet, and wait for the two separate truck pickups on Tuesday. For the trip home we saved on expenses by tossing the cart frame and taking advantage of local friends who had driven to St.Louis and had space for our stuff on the return trip. 1796 in Long Island City offered us space on their bus to take some of our equipment. We just had to drop by the next week to pick it up in Queens. Thanks 1796! Connetquot team 3137 unpacked our robot crate and tools pallet for us Wednesday night at Championship. Thanks 3137! 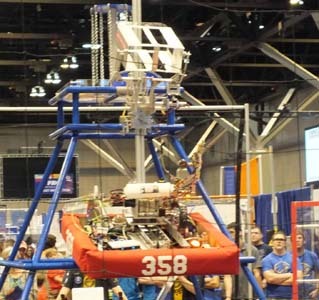 The 358 team's flight arrived Wednesday at 4:30pm and the pit crew got to the dome about 6pm and was able to go right to fixing a few things broken in shipping (or forgotten at home, e.g., one of our hooks) and getting robot inspection done. On Thursday we practiced in the morning and qualifying matches began immediately after lunch on Thursday, running until 7pm, then all day Friday, finishing late Saturday morning. Officer elections were held the evening of May 14 and the results were announced a week later at our annual Pot-luck dinner. Dinner in the Commons had lots of dishes to pick and choose from. The year-end slideshow, mentor gifts, senior graduation cords for Robotics, all made us realize how much we will miss our seniors.